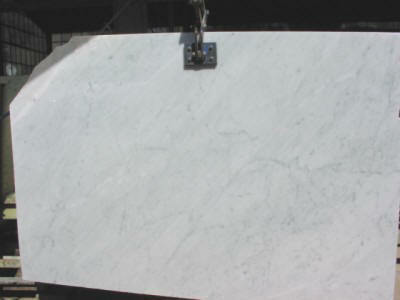 Marble Slabs cm. 2, 3 and thickness on request: Sizes are from cm. 150x80 up 300x180; usually bigger the sizes and more expensive are; big sizes are used to fabricate countertops and special cut to size projects, mean little medium sizes are used to produce tiles, steps, mosaics and othert cut to size works.Avaialble also any kind of size on request for Italian marble, Onyx, Limestone, Travertine and Granite. White Carrara C and White Carrara Venatino are more light than white Carrara CD and White Carrara CD Venato; White Carrara CD Venato and White Venatino has more marked veins that are better for book match floors or in case the customer want to see a clear design in the veins.